What is Positive Behavior Interventions and Supports (PBIS)? PBIS is a research-based, school-wide approach to improve school climate and create safer and more effective schools. PBIS is a Process. This process focuses on improving a school’s ability to teach behavioral expectations and support positive behavior for all students. PBIS provides systems for schools to design, implement, and evaluate effective school-wide, classroom, non-classroom, and student-specific discipline plans. PBIS is a team-based process for data review, data-driven problem solving and interventions, ongoing planning, and monitoring of interventions. PBIS implementation includes school-wide procedures and processes intended for: ALL Students, ALL Staff, and ALL Settings. This includes individual classrooms and teachers and non-classroom settings and related staff. 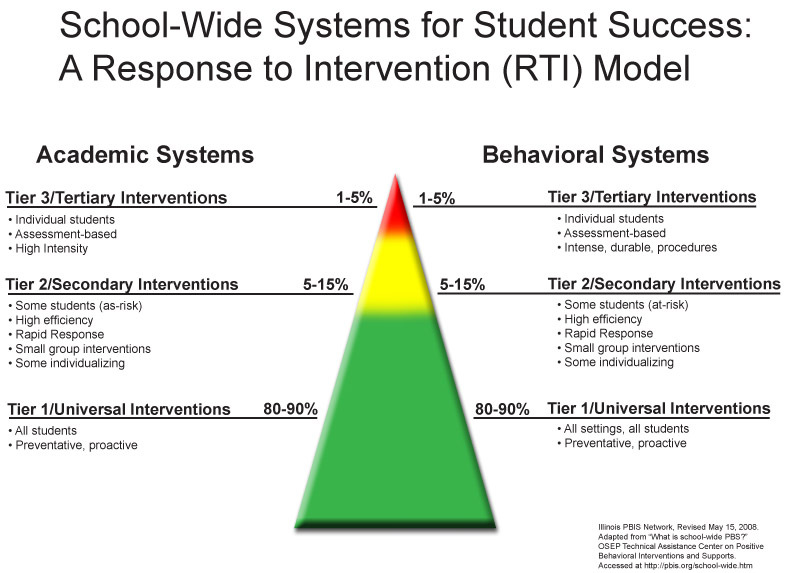 As a Response to Intervention Model (RTI), PBIS applies a three tiered system of support, and a problem solving process to enhance the capacity of schools to effectively educate all students.